The Script Editor gives you possibility to create and edit animation scripts based on objects (small images). 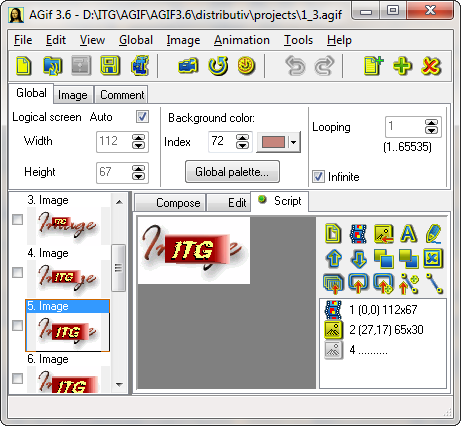 Select tab Script in Image Area and Script toolbox will appear on the screen. Animation is built by manipulations with these objects. You can move object, change it size, rotate it on 180 or 90 degrees, edit object by graphic tools, bring it to front or send to back, transform and set visibility of object in any frame. Animation script is saved in project (file with extension .agif) and allows you edit object parameters easily and fast. - To clear existent script click the toolbox button . - To put selected frame from the List of images as an object to script click the toolbox button . - You can add objects from file (the toolbox button ), from Image collection or from dialog Export button image (radiobutton Copy to script). Also you can use text (the toolbox button ) as an object. Icons in the list of objects denote object types. If you click on object by mouse or select it in script list then this object is marked by rectangle with 8 markers on a perimeter. Markers are used to change object size. If flag Stretch in dialog Object attributes is checked then object image will be resized. Dialog Object attributes appears after double click on object or script list, or by click the toolbox button . - To replace selected object image in all frames simultaneously use buttons or of dialog Object attributes. You can move selected object by mouse and edit it's attributes. Note: if you want to select one of overlapped objects on image use mouse with Ctrl key or script list. only on tab Script if this tab is inactive. To see frame with added objects on other tabs and in the List of images you must put snapshot of script to the current frame by toolbox button or to new frame click the toolbox button . Button is intended for hand transformation of all GIF-frames on the basis of script if the tab Script is inactive. In this case objects will be visible in all frames. when you put snapshot of script to the current or new frame then color palette will be transformed to 256 colors. 1). bring selected object to front or send it to back among all other objects with the help of toolbox buttons or . If you move object in the script by means of buttons ( ) then you can bring selected object to front or send it to back among neighbour objects. 2). delete selected object from script by button . 3). manage object position on background picture using the following buttons: - to insert frames to GIF (these can be background pictures together with objects or without them); and - to set fixed position, movement along the chosen trajectory or linear motion trajectory of an object for some range of frames or for all frames. if you delete any object on active tab Script then it will be deleted from all images in GIF frames and in the List of images too. if you delete any object which already was added to the current frame and tab Script is inactive then your animation does not changed but you can not edit this object in Script (but you can edit frame image in Image Editor on tab Edit).